Brint Driggs came to us looking for some help with his Internet golf pro consulting business. He had some great ideas but wasn’t sure how to get traffic that would be converted to sales to his pages. We helped Brint out with a complete online marketing consultation with a written keyword analysis. Later we then set-up his Google AdWords marketing campaigns and helped him add some unique customer retention features to his Web site pages . We us in-line pop-over technologies to offer last minute incentives and information regarding products or services available on the site. Brint opened his doors in 2009 and is now on his way to owning a profitable online storefront. 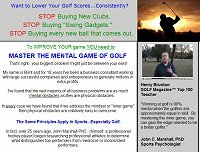 He hopes to continue promoting his site and his golf pro assessment product to Golf enthusiasts throughout the Internet. A brief Google AdWords advertising campaign, a Digg.com submission or two, and some well done search engine optimization, has earned Brint a first page position on Google for the search terms related to improving your golf game.